Featured photo: A kindergarten classroom’s Virtual Learning Center. Personalized Learning, Differentiation, Individualized Learning, Virtual Learning—all ways of saying that we are striving to do what is best for every single student when it comes to education. These are all variations on the current “buzz words” in education today. However, for self-contained primary level teachers these are not “buzz words” or are they anything new at all. As a 32-year veteran of education, I was doing small group, individualized, and differentiated learning in my fourth grade classroom in 1984. I guess I was “personalized before personalized was cool.” I was not alone then and primary teachers have not been alone in the practice over the past 30 years. One of the keys behind personalized learning now is to create an “environment” where students feel relaxed and more at ease in their learning. We see cafes and coffee shop style settings crop up in high schools and middle schools. These areas have always existed in primary classrooms. They take on the shape of teepees, treehouses, living rooms and more. One of the big differences is how they are funded. While grants and initiatives are implemented to create learning labs and settings in upper grades, primary teachers have another approach. When you walk room to room in a primary school you will see items from one another’s basements and garages recycled into classroom furnishings. You will see garage sale and thrift store finds that have been cleaned and refurbished. Spray paint and duct tape are a primary teacher’s best friends. Over the summers, they work day and night in their classrooms to create a “personalized” setting to greet their students each August. Most of the funding for these learning labs comes from each teacher’s personal funds. I am thrilled to see that the idea is catching on beyond the elementary level. I just hope that the promotion and funding of these projects trickles down as the ideas trickle up. 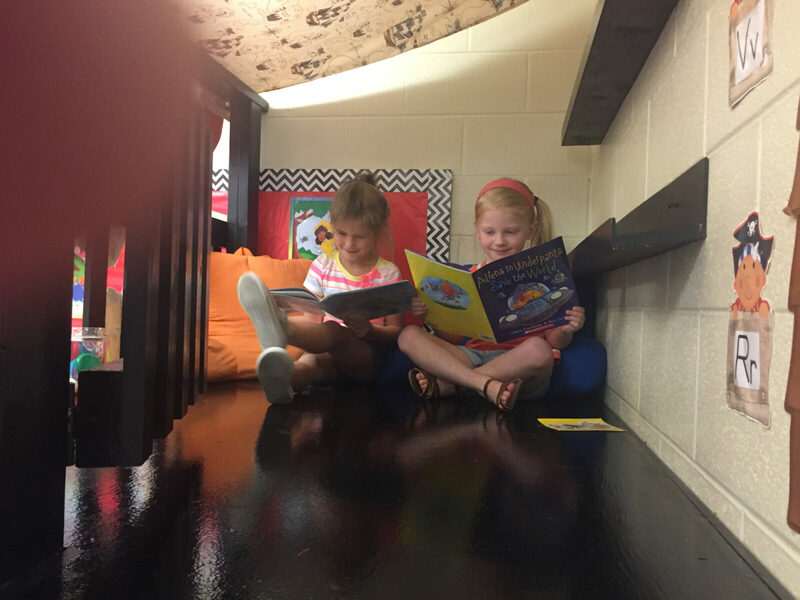 Loft: A cozy place to practice reading skills in the reading loft in Mrs. Julie Cowan’s classroom.